The heart of Advanced Relay's product line is the LayGO® Multiprotocol Toolkit for the do-it-yourself or do-it-jointly development of multiprotocol WAN products, such as bridges, routers, gateways, FRADs, PADs, multiplexers and special communication servers (e.g. X.25 to TCP/IP gateways). 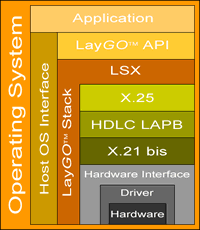 The LayGO® Application Program Interface with a set of functions common to all protocols. Protocol Modules implementing X.21/X.21 bis, Frame Relay, LAPB, LAPD, X.25, HDLC and Bisync. Device drivers for several 3rd party and proprietary synchronous communication hardware. The synchronous communication card itself. * Please check with sales for versions and/or distributions supported.